Visitors to Mesa Verde National Park are enjoying the winter scenes. Tourists Eiji Shibata and Julianne Chechanover, from Southern California, prepare to snowshoe at Mesa Verde National Park on Thursday. 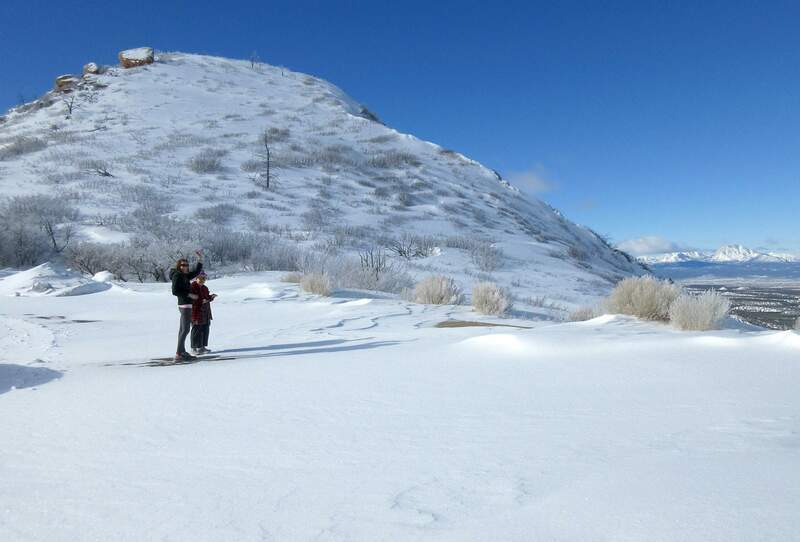 The park provides free snowshoe rentals. The snow-covered La Plata Mountains, seen Thursday from the Mesa Verde National Park road. A group of five hardy tourists huddled against the frigid cold Thursday morning waiting for the gate to Mesa Verde National Park to open. 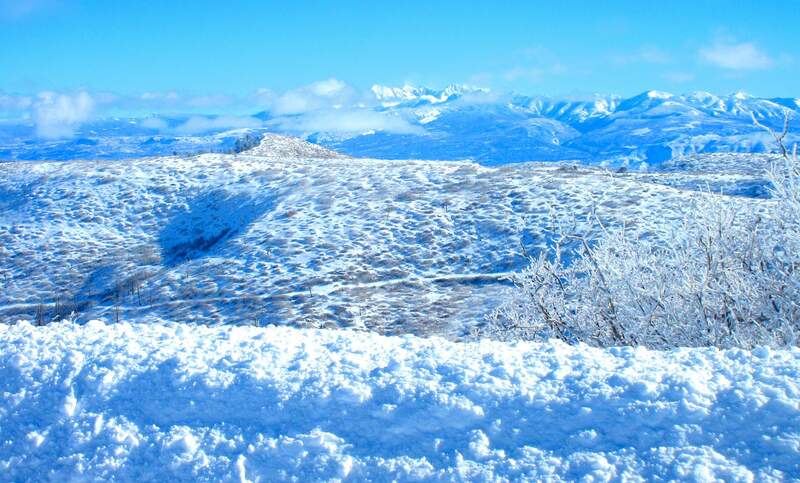 Four inches of fresh snow had fallen, and the previous days’ blizzard conditions forced the closure of the park. The park had just reopened Feb. 1 after a five-week government shutdown that ended Jan. 25. The park needed another week to clear a massive boulder fall plus snow that piled up on the twisting 21-mile road. “We’ve got it ready for you folks,” said plow driver Deshay Morning. And the gate swung open. Winter services at the park are limited to the visitor center, a scenic drive, bathroom access, snowshoeing and cross-country skiing and a tour of Chapin Mesa Museum with lunch at the Spruce Tree Terrace restaurant. Five-foot-high snow piles lined the road from the plow work as views of the snowy La Plata Mountains came into view. The road seemed to tunnel through in places, and a few turnouts were accessible, including one that went to a bathroom. At the Chapin Mesa Museum, the halls were empty, and so was the restaurant, except for one employee. “February is one of our slower months anyway, and the weather and snowy roads have made it lower,” said park public information officer Cristy Brown. A chef at Spruce Tree Terrace on Chapin Mesa was glad to be back to regular shifts. “I’ve never been happier to flip a cheeseburger,” Joe Boulet said. 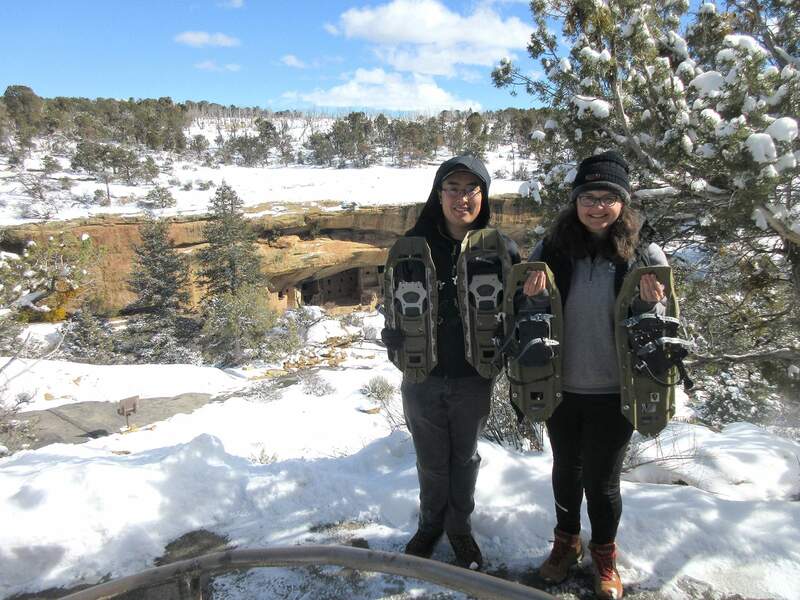 The park rents snowshoes for free, and Julianne Chechanover and Eiji Shibata, visiting from Southern California, took advantage of the offer. They two specifically wanted to visit Mesa Verde but delayed their trip when the partial government shutdown began Dec. 22. In an interview with The Journal on Thursday, park Superintendent Cliff Spencer and Brown talked about the shutdown and park operations. During the furlough, about 12 “excepted” staff who were deemed essential to life, health and safety were required to continue working. They included law enforcement, EMTs and water treatment staff. “Due to the lapse of appropriations, the rest of us, including me, were required to leave our work computers and electronics and go home. They would let us know when to come back,” Spencer said. Contacting or responding to media requests by park staff was not allowed until the shutdown was lifted, late on Jan. 25, he said. After the shutdown, the park’s main road remained open for a few days, then was closed because of snowstorms and a large rockfall. The park did not have enough resources to deal with it. The Montezuma County Road and Bridge Department offered to help clear the road to keep it open for tourists. Spencer said he “would have considered” the county’s offer if not for the added “complication” of a rockfall. And some staff did not receive pay from Dec. 31 to Feb. 5. On whether the park road could stay open if the shutdown continues after a Feb. 15 budget deadline, Spencer said the decision would be up to P. Daniel Smith, acting director of the National Park Service. Typically, parks with roads that pass through them to towns and are vital to commerce and travelers are a priority to stay open during government shutdowns. Smith also would determine whether Mesa Verde would be authorized to use funds from park fees to support limited day-to-day operations if another shutdown occurred. Normally, entrance fees are earmarked for improving visitor amenities, such as new restrooms, campgrounds or bathrooms. Brown said the shutdown delayed park projects and staff was catching up on jobs. She said visitor services were not expected to be affected. The hiring process for summer workers also was delayed, but the park is expected to have its usual staff of 200 ready for the tourist season. There will be a full firefighting staff as well.